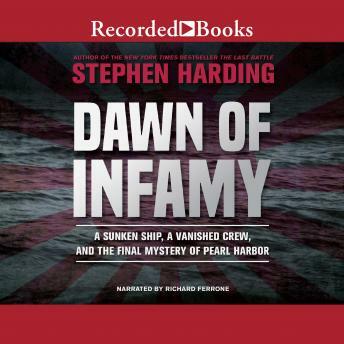 New York Times bestselling author Stephen Harding explores the little-known episode of a US cargo ship that mysteriously vanished, along with her crew, hours before the attack on Pearl Harbor, marking the start of a global conflict and sparking one of the most enduring nautical mysteries of the war. On December 7, 1941, even as Japanese carrier-launched aircraft flew toward Pearl Harbor, a small American cargo ship chartered by the Army reported that it was under attack from a submarine halfway between Seattle and Honolulu. After that one cryptic message, the humble lumber carrier Cynthia Olson and her crew vanished without a trace, sparking one of the most enduring nautical mysteries of the war. What happened to the ill-fated ship? What happened to her crew? And was she Japan's first American victim of the Pacific War? Based on years of research, Dawn of Infamy explores both the military and human aspects of the Cynthia Olson story, bringing to life a complex tale of courage, tenacity, hubris, and arrogance in the opening hours of America's war in the Pacific.